We met in the Spring of 1996 on "F" Dock at the Portofino Marina in Redondo Beach, California. At the time, Jan owned a 25’ MacGregor sailboat ("Yahoo") with her friend Camille, and their slip was FB-9. Rich bought a 27’ Catalina sailboat ("Zubenubi"), and moved into slip FB-10. Rich spent most of his time working on his boat, but Jan and Camille spent most of their time sailing their boat. One beautiful sunny day, Jan, Camille and John (Camille’s fiancée) invited Rich to sail with them to Marina del Rey for lunch. It was the start of something good, and we were married July 3, 1999. 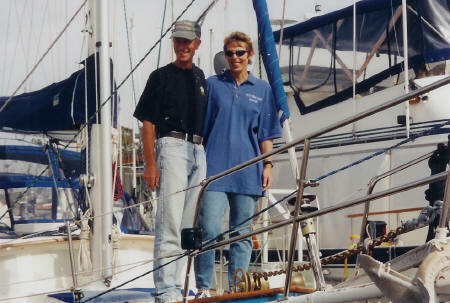 In early 2000, we were planning a sailing vacation to the British Virgin Islands, and Jan "floated" an idea by Rich about selling the house, moving to the Caribbean and living on a sailboat. Both of us love the ocean and scuba diving, and although we enjoyed living in Southern California, the ocean here is cold, and diving in the warm Caribbean waters was very appealing. Rich liked this idea, and our plans started to develop. In short order, we found out about and joined the Seven Seas Cruising Association (www.ssca.org). Soon, our plans moved beyond living in the Caribbean to circumnavigating the globe. We're looking forward to an exciting future!